So you’re in college and you wake up every morning to that tiny little ray of sun shining right on your closed eyes. This ray does not make you a happy camper. No. This ray is the bane of your existence. You pull your pillow over your head but then you feel like you’re suffocating. You wake up groggy and grouchy. Well, college student, do we have a solution for you: Collegiate Window Shades. Collegiate window shades come with a variety of your school’s logos so there’s plenty of choice. Blinds Chalet introduces new Cityscape Roller Shades to bring a new perspective to offices, bedrooms or apartments. People no longer have to fly to Paris to see the Eiffel Tower or New York to look out at the Empire State Building during the day. These stylish custom-made cityscape roller shades bring popular images from the Brooklyn Bridge to Chicago Lights as well as the Golden Gate Bridge to houses, work spaces and more. Blinds Chalet introduces their new Collegiate Window Shades. These window treatments are perfect for current college and university students as well as proud alumni. Collegiate window shades showcase a variety of logos for each school to provide a variety of decorating options. These window treatments are the perfect addition to dorm rooms, game rooms, rec centers, and collegiate housing. For the proud alumni, what better way to show your support than by hanging these window treatments in game rooms, home theater rooms and more? 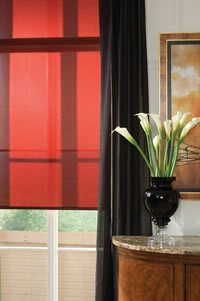 Blinds Chalet launches a new Smart Weave line of solar screen roller shades. Solar screen roller shades are designed to prevent glare and block UV rays. They help increase insulation in homes and work spaces. By blocking the sun’s glare, these window treatments prevent the need for high levels of air conditioning. Screen roller shades are ideal for offices, restaurants or anywhere the sun’s glare is a problem. Because of the Smart Weave nature of the shades, they are not intended to provide privacy, but instead are created to preserve views. Blinds Chalet introduces Tavarua Sunscreen Bamboo Roller Shades. Tavarua Bamboo Roller Shades are made from sustainable bamboo that is both biodegradable and earth-friendly. These roller shades are made from real bamboo woven into sunscreen patterns. The design blends the functionality of a solar screen roller shade with the style and elegance of a bamboo shade. Major League Baseball is coming to homes across the US. Blinds Chalet now offers MLB™ Window Shades. Whether you’re a New York Yankees, Boston Red Sox or Chicago Cubs fan, there is a roller shade available with the favorite team’s logo. Major League Baseball is coming to your home. Blinds Chalet now offers MLB Window Shades. Whether you’re a New York Yankees, Boston Red Sox or Chicago Cubs fan, there is roller shade for you with your favorite team’s logo on it. Available in numerous color combinations and a variety of logos for each team, these window treatments are perfect for kids’ rooms, or for the grown-up kid in your family. 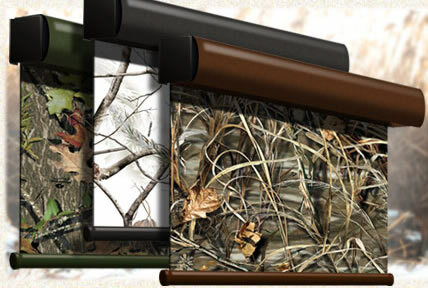 A perfect accent for game rooms or men dens, these window treatments let your guests know whom you are rooting for. MLB™ Window Shades are a great way to show support for your favorite team. Roller shades are known for their light filtering abilities. With blinds down, you’ll be able to enjoy the baseball game without eye-straining glare on your TV. If you prefer to immerse yourself in the world of baseball without any distractions like daylight, you can opt for the blackout fabric. Blinds Chalet custom makes each blind to your window’s specifications so your favorite team’s logo is perfectly centered and proportionate to your window size. To help sweeten the deal, Blinds Chalet is currently offering 30% off your order. Be the first in your neighborhood to own these roller shades. Order them on-line today! With one of the hottest summers in years sweeping the nation, people are looking for ways to stay cool in the summer heat. Window treatments are an easy, inexpensive way to help cut air-conditioning costs and to get a little relief from the sun. Blinds Chalet has compiled their list of the top three blinds for desert living and is also offering 30% off purchases as well as free shipping in order to help people remain comfortable for the remainder of the summer. Some products offer two-day shipping so relief from the heat can start immediately. Roller Shades are an ideal window treatment for homes and offices. They are a perfect compliment for floor-to-ceiling windows and large windows that receive direct sunlight. Their sheer weave design comes in a variety of openness, which refers to the amount of light enters the room. Roller shades maintain views while blocking UV rays and help keep rooms cool. Blinds Chalet introduces Sheer Weave Roller Shades with insulating properties to help keep homes cool in the summer. Roller Shades are woven shades in which the openings in the fabric allow for scenic views while blocking the sun’s harmful rays. Blinds Chalet’s Sheer Weave Roller Shades come with a 14% openness offering excellent to superior UV ratings when closed. The most common selection for window blinds and shades are neutral colors such as white window blinds or tan window blinds. Most wood and faux wood blinds are only offered in white tones or stains. However, there are other options are available if you are looking to add a little color to your decorating. If you are reading this, then chances are you have some roller shades that do not quite work like they are supposed to. Before you toss them out and buy some new ones, here are some quick fixes.